Planetary occultations are a well-proven technique for measuring the sizes of solar system objects too small to be resolved in an angular sense and for obtaining pressure and temperature profiles of planetary atmospheres. Planetary occultations have been routiniely observed from groundbased sites for decades, and (in high-priority cases) by the NASA Kuiper Airborne Observatory (KAO) when it was operating. Unfortunately, many events are missed either because of bad weather or because they occur over water (which covers over 70% of the Earth's surface). I am working with Alan Stern (SwRI) to develop techniques for, and to flight demonstrate the capability of, observing scientifically valuable planetary and asteroidal occultation events from high-performance NASA aircraft. This project utilizes the SWUIS-A instrument developed by our group and successfully flight-demonstrated aboard NASA WB-57 and F-18 aircraft flying out of JSC and DFRC. SWUIS (the Southwest Ultraviolet Imaging System) is an imaging telescope/camera system sensitive to mid-ultraviolet, visible, and near-infrared wavelengths that was developed as a mid-deck locker experiment aboard the Space Shuttle. SWUIS-A is a simpler, airborne version of the system now being developed to provide a low-cost, fast-response planetary occultation capability to the scientific community. 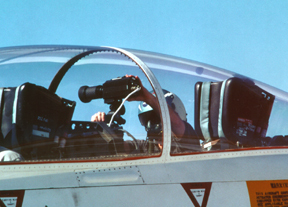 SWUIS-A consists of an image-intensified CCD camera with broadband response in the visible, accompanying high-quality foreoptics, a miniature video recorder, an aircraft-to-camera power and telemetry box with camera controls (called the PIB), and associated cables, filters, and other minor equipment. The primary SWUIS-A foreoptic is a high-quality, fixed focal length 85mm f/1.4 lens with a field-of-view of 8.7 deg. A 60-300 mm zoom lens, with a continuously-variable field-of-view capability from 13 to 3 deg is also flown. The SWUIS-A ICCD frames at video rates, which is a key requirement for both jitter compensation and the high time resolution needed for occultation studies. SWUIS-A image coadds can attain a limiting astronomical magnitude of V=10 in <1 sec with dark sky conditions. Click here to read about the successful SWUIS-A mission to observe the 308 Polyxo occultation event the evening of 9 Jan 2000. The collisional disruption of main-belt asteroids has been linked to the production of interplanetary dust particles (IDPs) by the discovery of the IRAS dust bands and their demonstrated association with major asteroid families. A detailed understanding of the dust production from the catastrophic disruption of asteroids and the subsequent comminution of their debris is therefore required to relate the chemical and mineralogical properties of IDPs collected at Earth to their parent bodies in the mainbelt. George Flynn (SUNY-Plattsburgh) and I have begun a series of impact experiments to directly investigate the production of dust-size fragments in hypervelocity impacts. The goals of this research project are: (1) To determine the physical, chemical, and mineralogical properties of dust-size fragments from the impact disruption of meteorites. We will assess to what extent we can infer the bulk properties of the parent meteorites from analysis of the fragments. This will lead to a better understanding of the relationship of IDPs to their parent asteroids in the mainbelt. (2) To determine the size (and velocity) distribution of dust-size fragments from the impact disruption of meteorites. The results from the latest collisional models of main-belt evolution show that knowledge of the production function of the smallest particles is required to understand the collisional evolution of even the larger asteroids. (3) To quantify the fragmentation mechanics (size distribution of large fragments and target impact strengths) of actual meteoritic materials. This is a secondary objective of this research program, but is a natural by-product of the impact experiments and will provide valuable data that will be used to validate and constrain both hydrocode models of impacts into asteroidal materials and collisional models of the main-belt. So far, we have conducted a set of impact experiments on terrestrial basalt as a feasibility study for the more detailed experiments involving actual meteorites. Using the NASA Ames Vertical Gun Range, we impacted three ~300 gram samples of porphyritic olivine basalt with ¼ inch aluminum spheres at speeds of ~5 km/s. The basalt was selected as a target because it exhibited two features similar to the carbonaceous chondrite meteorites: (1) it consists of large olivine phenocrysts, typically a few millimeters in size, in a weaker, fine-grained matrix, and, (2) it exhibits significant porosity, with observable vesicles. The results so far suggest that carbonaceous chondrite parent bodies might preferentially overproduce olivine-rich debris at the size scale of the chondrules and that olivine might be underrepresented in the debris at substantially smaller sizes. Our test experiments produced very useful data, demonstrated the validity of our approach, and clearly showed the need for further experiments with actual meteorites. Our experiments on meteorite samples (Allende and an ordinary chondrite) will begin in late 2001. Click to see a QuickTime (555K) or mpeg (2534K) movie of one of our basalt targets being destroyed. The 500 frames/s video clearly shows the target disappearing in a cloud of cm- and mm-scale fragments and dust. 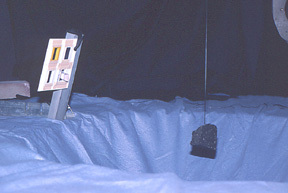 The white squares behind and to the sides of the target rock (hanging from a black thread in the center of the experiment chamber) contain foil and aerogel detectors for analysing the size distribution of the dust-size fragments and their chemical and mineralogical properties. Interior to Mercury's orbit is a dynamically stable region where a population of small, asteroid-like bodies called Vulcanoids has been hypothesized to reside. The Vulcanoid Zone (VZ) extends inward from about 0.21 AU, a stability limit set by eccentricity perturbations due to Mercury and the other planets, to about 0.07 AU, where thermal conditions and dynamical transport mechanisms such as Poynting-Robertson (PR) drag and the Yarkovsky effect rapidly remove smaller objects. This putative reservoir plausibly contains a sample of condensed material from the early inner solar system, and bears additional relevance to our understanding of Mercury's cratering record. Alan Stern (SwRI) and I have conducted numerical models of the collisional evolution of various-size populations of objects in this region that suggest that a modest population of km-scale or larger objects could have survived the harsh collisional environment in this region from primordial times to the present epoch. The most favorable locale for residual bodies to survive is in low eccentricity orbits near the outer edge of the dynamically stable zone (i.e., near 0.2 AU). Our results suggest that a population of a few hundred objects larger than ~2 km in diameter could presently exist in the VZ, with perhaps a few tens of such objects in the 0.01 AU-wide band near the outer stability boundary at 0.21 AU. Bill Bottke (SwRI) and collaborators examined the removal of Vulcanoids from this region through the Yarkovsky effect and reached a similar conclusion. Although a modest population of Vulcanoids may well exist, they will be particular hard to detect, due to their angular proximity to the Sun and relative faintness against a twilight sky. Viewed from 1 AU, the inner and outer boundaries of the VZ correspond to maximum solar elongation angles of only 4 deg and 12 deg (15 and 45 solar radii), respectively. Consequently, only a few visible wavelength observational searches for Vulcanoids have been conducted, and these have been limited to relatively bright limiting magnitudes, corresponding to objects with diameters larger than ~20-60 km (assuming Mercury-like albedos and phase functions. We recently completed a search for Vulcanoids in coronagraph images obtained by the Solar and Heliospheric Observer (SOHO) spacecraft. We recognized that SOHO's Large Angle Spectroscopic Coronagraph (LASCO) instrument, which has been routinely detecting sungrazing comets, provides an opportunity to explore the inner heliosphere to search for small bodies orbiting the Sun. We therefore examined a 40-day continuous sequence of white light images obtained by the LASCO C3 coronagraph to search for Vulcanoid candidates. Although we detected no Vulcanoids to a moving object detection limit of V=8 (20-60 km diameter objects), our search was far more comprehensive than past ground-based searches. Future searches complete to magnitudes fainter than V=8.0 are required in order to place tighter constraints on the size of the Vulcanoid population. We are working to conduct a deeper and more extensive Vulcanoid search than has ever been made. The limitations that have plagued past ground-based visible-wavelength searches for Vulcanoids can be greatly alleviated by reducing or removing the various observing problems (clouds, variable hazes, turbulence, scattered light, high airmass, etc.) associated with the atmosphere. We are preparing to fly our SWUIS-A astronomical imaging system to altitudes over 70,000 feet aboard a USAF U-2 aircraft. 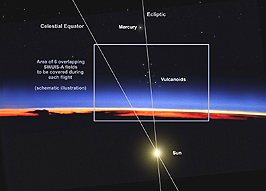 From above more than 90% of the Earth's atmosphere, in deeper twilight than is ever possible from the ground for objects so close to the Sun, we will be able to detect Vulcanoids down to at least magnitude V = 12.5, corresponding to objects only 8 km across at the outer boundary of the Vulcanoid zone. This is at the location and in the size range where we predict that a sizable population of Vulcanoids is most likely to exist. Covering some 108 square degrees to limiting magnitude V = 12.5, this effort will result in the most comprehensive, constraining search yet conducted for these objects. The figure to the left illustrates the geometry of a search for Vulcanoids from high altitude at twilight near the equinox. As viewed from the southwest United States, the ecliptic is nearly vertical with respect to the horizon at the equinox. The outer limits of the Vulcanoid zone extend outward from the Sun to about 12 deg along the ecliptic. Our airborne search will cover over half of the Vulcanoid zone and beyond to ~15 deg solar elongation and out to 6 deg north and south of the ecliptic. 35th Annual DPS meeting poster 36.01 "High-Altitude Searches for Vulcanoids: Observations from F/A-18B Aircraft"
65 million years ago a 10 km diameter asteroid or comet slammed into the Earth near what today is the Yucatan Peninsula. 75% of all the species alive at the time, including the dinosaurs, became extinct as a result of a number of complexly interacting environmental and ecological perturbations caused by the impact. 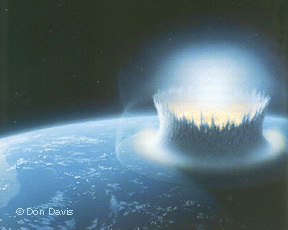 Ejecta from the impact forms a boundary sequence (the K/T boundary) composed of two macroscopic layers in North America and a single layer in the eastern hemisphere. The lower layer in (and adjacent to) North America is interpreted to be relatively low-energy ejecta deposited from the crater's ejecta curtain, while the upper layer is derived from higher energy ejecta carried in a vapor plume that rose far above Earth's atmosphere and distributed material globally. Unfortunately, we still do not understand the details of these processes, even though many post-impact environmental effects depend on the mass distribution in each of these ejecta units and the timescales over which they were deposited. 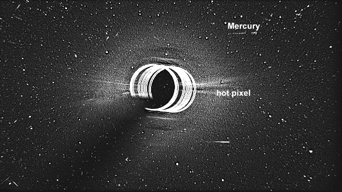 To examine the trajectories of material in the vapor plume and the ejecta curtain and the effects the ejecta might have on the post-impact environment, David Kring (LPL) and I constructed a computer simulation of the launch and deposition of the low- and high-energy ejecta. 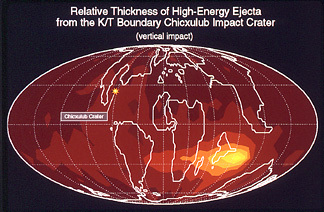 The low-energy ejecta is distributed more or less symmetrically around the impact site and is concentrated within about 1000 km of Chicxulub. The high-energy ejecta is distributed globally, although it is concentrated near the antipode, where the sub-continent of India was located 65 million years ago. 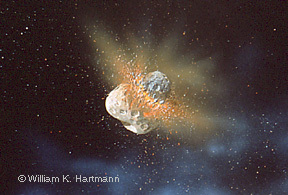 Most of the high-energy ejecta stays within 50,000 km of Earth, with several percent reaching 100,000 km or more, before reentering the atmosphere. Approximately 25% of the material reaccretes within 2 hrs, ~50% within 8 hrs, and ~75% within ~72 hrs. We also found that at least 20-30% of the ejected material escapes, even when we make the very conservative assumption that the speeds of materials in the vapor plume are <11.2 km/s (Earth's escape speed). This is due to the effect of the Earth's rotation, which adds 0.4-0.5 km/s to material launched in the same direction as Earth's rotation. In reality, some material will be launched at greater than escape speed, so that the fraction of material lost from Earth will actually be greater than 20-30%. These results lead to some potentially useful conclusions about the post-impact environment. In either a vertical or oblique impact event, the amount of heating in the upper atmosphere by reaccreting high-energy ejecta may be greatest at the antipode and above the impact site, although a time-intregrated series of calculations is needed to accurately determine the magnitude of this effect. Nonetheless, this could be an important factor when calculating post-impact chemical reactions in the stratosphere and on the possibility of the ignition of fires on the surface. resulting in mutual capture into gravitationally bound pairs (left) or in extremely low-speed collisions forming contact binaries (lower right). The results of my numerical models show that asteroidal satellites are indeed a natural outcome of catastrophic collisions. A small fraction of the fragments of the parent asteroid end up in gravitationally bound pairs, either orbiting each other or in contact configurations. Another possible mechanism for forming small satellites about asteroids is through the mutual reaccretion of ejecta from large cratering impacts on the primary. In the absence of collisions or other perturbing forces, a particle ejected from the surface of a rapidly rotating, irregularly shaped asteroid will eventually re-impact the primary if it does not escape the system altogether. A small satellite cannot then be formed simply by launching a large ejecta block directly into orbit. 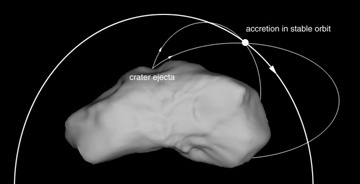 However, numerical integrations of the trajectories of impact ejecta around 243 Ida show that many debris particles can temporarily co-exist in complex orbits about the primary, offering the possibility that a fraction of the crater ejecta might collide and mutually reaccrete in orbit. Paul Geissler (LPL) and I examined the accretion of ejecta particles from three craters on Ida: Azzurra (Lat +30, Long 220), Undara (Lat 0, Long 120), and a hypothetical crater located at the north pole of the asteroid. In each case we assumed a crater diameter of 10 km, and followed the evolution of 1000 ejecta particles (each 68 meters in diameter) for 100 hours after the cratering impact. In order to increase the probability of inter-particle collisions for so few particles, the particle sizes were increased by a factor of 3 and the resulting accretion statistics normalized accordingly. Our most significant results from this ongoing study so far are: (1) The formation of asteroidal satellites by accretion of cratering debris is inefficient at best. Although accretion events do regularly occur, we have not yet seen the formation of accreted particles in stable orbits. Our model results indicate that in the first 100 hours following a large cratering collision, up to 0.1% of the ejected debris will have accreted while in flight around the primary. (For comparison, the formation of Dactyl would require the accretion of roughly 3% of the ejecta from a 10km diameter crater on Ida.) 80-90% of these accreted particles eventually re-impact Ida, with the remainder escaping the system altogether (we see essentially the same behavior for indiviudual ejecta particles). 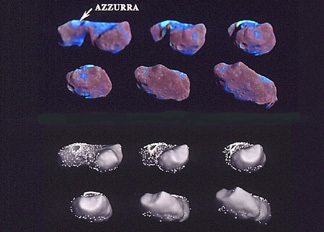 (2) There is a very strong selection for accretion of particles on trajectories with inclinations resembling that of Dactyl: For debris accreted from the craters Azzurra and Undara, the majority of accreted particles are formed in prograde orbits nearly coincident with Ida's equatorial plane. This can be understood when we realize that the vast majority of ejecta launched initially in the direction opposite the primary's sense of rotation rapidly re-impact the surface of the asteroid. Only those particles launched in the direction of rotation are lofted on trajectories high enough to allow sufficient time for there to be a significant probability of encountering other particles. (3) The location of the source crater appears to be significant in affecting not only the efficiency of the ccretion process, but also the distribution of orbital elements for the accreted particles. Only 0.007% of ejecta accreted from a hypothetical crater at Ida's north pole; accretion of debris from craters nearer the equator is observed to be as much as 15 times more efficient. As might be expected by symmetry, there are no prefered inclinations from debris originating from polar craters. Because of their low gravities, asteroids represent a valuable and previously inaccessible laboratory for the study of space erosion and the mechanics of impact cratering. The non-spherical shapes and rapid rotation of many asteroids produce interesting dynamical environments in which marked non-uniformities of soil thickness can be expected to occur. Careful study of the characteristics and spatial distribution of regolith on such a body may provide important insights about the nature and physical properties of the asteroid, its collisional and erosional history, the population of impactors which crater its surface, and the details of impact cratering in a low-gravity regime. Each of the asteroid-like objects so far imaged by spacecraft has shown substantial evidence for the presence of regolith. Direct indications include high resolution imaging observations of the Martian moons Phobos and Deimos and the main-belt S-type asteroid 243 Ida, all of which have large (up to 150 m diameter) angular blocks on their surfaces. These are presumed to be fragments of impact ejecta, and thus represent the coarsest size fraction of impact-generated soil on these small object. Indications of mass-wasting or landslides have been interpreted on Deimos and Ida, suggesting regolith accumulation on slopes beyond the angle of repose. Although the lower resolution images of Gaspra preclude similar such direct observations, many lines of evidence such as the subtle color differences between ridges and topographic lows are suggestive of regolith development on this S-type asteroid as well. The existence of soil on the smallest solar system bodies supports the view that a substantial fraction of the ejecta from impact events on small bodies may be retained. At present, predictions of ejecta velocities and regolith retention rates are derived largely from extrapolating observations made under very different circumstances. The nature of cratering in low-gravity environments like the surfaces of small asteroids is largely unknown. Spacecraft imaging of the distribution of regolith on asteroids provides an important opportunity to obtain direct measurements of impact ejecta velocities on such small bodies. The size distribution of the main-belt asteroids provides a strong constraint on models of the collisional history of the asteroid belt. The most important factor in determining the shape of the evolved size distribution is the dependence of the critical specific energy on target size. The critical specific energy, Q*, is the energy per unit target mass required to fragment and disrupt a target asteroid, leaving a largest remnant with 50% the mass of the original target. A number of studies have focused on determining how Q* varies with the size of the target asteroid. Treatments of the size dependence of Q* have generally been considered in two separate regimes: the strength-scaling regime, where the response of small targets to catastrophic impacts is governed by material strength and Q* decreases with increasing target size, and the gravity-scaling regime, where the outcome of collisions is dominated by gravitational effects and Q* increases with increasing asteroid size. Considerable uncertainty remains in the precise size dependence of Q* in the two scaling regimes as well as the size at which gravitational effects begin to dominate over inherent material strength. Rick Greenberg (LPL), Robert Jedicke (LPL), and I explored an alternative means of determining the size-strength scaling relation for asteroidal bodies. We utilized the fact that the detailed dependence of Q* on target size translates directly into observational features in the evolved size distribution. I showed in my Ph.D. thesis that the power-law index of a collisionally evolved population is linearly dependent upon the slope index of the size-strength scaling relation and that abrupt changes in the size dependence of Q* can result in distinct kinks or humps in the size distribution. Given that the evolved size distributions generated by collisional models depend strongly (and understandably) upon the shape of the size-strength scaling law, we least-squares adjust the strength law for asteroidal bodies to obtain a best fit to the actual asteroid size distribution determined from the catalogued asteroids and Spacewatch data. A successful match would be strong evidence that the corresponding size-strength scaling law is a good representation of the actual behavior of asteroids in catastrophic collisions. Our results show for the first time general agreement between the predictions of hydrocode models, the results of numerical collisional models, and the observed asteroid size distribution, and lead to a new interpretation of the shape of the main-belt asteroid size distribution. We find a strength scaling law which, when used within our numerical collisional model, gives good agreement with the two-hump structure observed in the actual size distribution of main-belt asteroids. The hump in the size distribution between ~3-30 km is a primary hump due to the transition from strength scaling to gravity scaling for asteroids larger than ~150 m. The well-known hump observed in the asteroid size distribution at ~50-200 km is a secondary hump resulting from wave-like structure induced in the size distribution by the ~3-30 km primary hump. Combined with results of continued laboratory impact experiments and further refinements to hydrocode our results should lead to a better understanding of the physical structure of asteroids of all sizes.